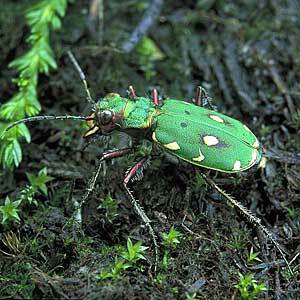 Description: A large (15mm) tiger beetle, green with yellow markings. It is found in areas with bare ground or sparse vegetation such as sandy heath, raised bogs, and gravelly or sandy hillsides. Adults are active in early summer and will often take to the wing when disturbed. 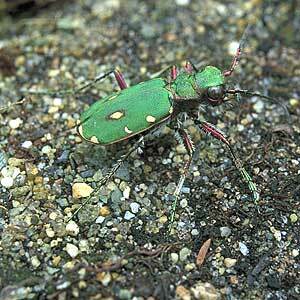 Both adults and larvae are predators on other invertebrates. The larvae dig a burrow in the ground, often on or near paths to pitfall-trap unwary insects. World Distribution: A Eurasian Wide-temperate species (65), distributed from Europe across Siberia to the Pacific Ocean. Irish Status: Widely distributed but local and uncommon, less rare in the south. Ecology: A thermophilic/xerophilic species of open ground and particular kinds of light, well-drained soils. Most recent records are for gravelly/peaty soils on hill land or the drier parts of raised bogs.